Louis-Philippe Hébert, Bronze 1901. On the western side of Parliament looking southwest. Laura Ford, for the British High Commission 1998.Unveiled as part of UKaccents, a year-loshowcase of UK arts in Ottawa, the three Nature Girls are Stump Girl, Bush Girl and Conifer Girl. Cooke-Sasseville, 2014 Concrete, wood, epoxy. At the intersection of Laurier and Boulevard des Allumettières. Remembrance Day - a view to "The Response"
The National War monument "The Response" by Vernon March is seen from the lawn in front of the East Block on Parliament hill. This monument was unveiled in 1939. Gerald McMaster, Riverside Drive transitway station. Noel Harding, stainless steel, plants, 2009 at the southwest corner of Slater and Kent Street Ottawa. Andrew O'Malley , Bronson Centre, 211 Bronson Avenue. City of Ottawa commission. The lit figures change in colour and intensity in a pseudo random pattern. Art Price, 1970. Alta Vista Postal Terminal at Industrial Avenue and Alta Vista Drive, Ottawa. Aluminum. Commissioned by Department of Public Works of Canada. This work no longer has functiong lights which transformed it at night. Coeur de Lion McCarthy 1938-9 Queenston Limestone. Canada Post Station B Sparks and Elgin Street Ottawa.The eponymous sculptor was the son of anothe important Canadia artist - Hamilton McCarthy who made the Jacques Cartier monument in Ottawa. "Berzerker" at the Odawa Native Friendship Center, Stirling and Scott streets Ottawa.. Destroyed. Louis Archambault, aluminum. ca 1958 Green Island, John G Diefenbaker Building 111 Sussex Drive. This is one of the former Ottawa City Hall sites. "Lecture Appliquée" courtyard in the Université du Québec en Outaouais. Although this work has wheels, they are just metaphors.. . Schools are a common context for public artworks . John Felicè Ceprano begun 1986 and continues annually. Remic Rapids south side of the Ottawa River. This ephemeral work made of balanced river stones is a popular landmark during the summer months on the western parkway. Michel de Broin, 2011, Salvaged street lamps from New Orleans post hurricane Katrina, lamps , electrical connections. Installed on the lawn behind the Great Hall of the National Gallery on Sussex Avenue. Ed Zelenak, 1968-9. Canada Garden Canadian Museum of HistoryGatineau. On loan from The Canada Council Art Bank for temporary display, removed 2004. Ron Keeneberg, IKOY, Gatineau Quebec. Karl Ciesluk 2011,. Aluminum ,stainless Steel and stone. 19 objects distributed along King Edward Avenue north of Rideau Street. LLoyd Pinay, unveiled in 2001. View from Confederation Park looking west to the Lord Elgin Hotel. Walter Allward 1920, cast bronze. Located on the southeast corner of the Supreme Court . There is a companion piece by the same sculptor - "Veritas" -located on the south west corner of the building. Felix Weiss, Bronze bas relief and concrete. There is an extended discussion of the fate of this - now gone - artwork here. Weiss is best known for his monumental sculpture depicting the flag raising at Iwo Jima. "War of 1812 Monument, Triumph Through Diversity"
Adrienne Alison, granite and bronze . 2012 One of many military commemorative works installed during the Harper government . This was installed to coincide with the 200th anniversary of the War of 1812. NCC. Richard Gorman 1986. Located in the Provincial Courthouse on Elgin Street in Ottawa. This image refers to the rapids on the Ottawa River where a dam is currently located as they might have appeared before settlement. This is one of Gorman's largest paintings. Barbara Patterson, 2000. Behind the East Block on Parliament Hill. The title refers to the reversal by the Privy Council of a Supreme Court decision deeming women as legally "not qualified persons" for appointment to the Senate. The figures are, Irene Parlby, Louise McKinney, Nellie McLung, Emily Murphy and Henrietta Muir Edwards..
"Balancier" by Yves Guérin, 1988. Stone, girders, repurposed industrial materials. Located on rue Montcalm just north of St. Joseph Boulevard in Gatineau in front of the former location for AXE-neo7 and Daimon artist run centres. Owned by Axe -neo7. Lost. Bruce Garner, Bronze doors Canadian Government Conference centre south side. 1973 Public Works and Government Services Commission? Cast aluminum doors by Jordi Bonet commissioned in 1969 for the Salon of the National Arts Centre. Levon and Hayk Tokmajyan, Ottawa 2002, Robert and Arlington street. "A tribute to Armenia symbolized my Mt. Ararat and the first people to embrace Christianity in 301 and the first nation to be crucified in the genocide of 1915-23"
"Never give Up!" - "Ne jamais abandonner! "by "au coeur du bronze". 2001. Thisportrait of Canadian sports hero "Rocket" Maurice Richard is on the south east corner where the Interprovincial bridge meets the city of Gatineau. This work is an NCC commission. Ron Bolt, 1989. Installed in the atrium at Minto Place in the office district , downtown Ottawa. Al McWilliams, Joost Bakker and Bruce Haden, 2012Marble and anodized aluminum. Richmond Landing, Ottawa River. During the tenure of the Harper government two other military commemorative monuments were also planned for this small site. Public consultation on this is underway. Colin Gibson, Broze 1991. Minto Place/Constitution Square. Robert Tait Mackenzie, Bronze 1937/1963. Canadian Boy Scout Headquarters Baseline Road near Clyde Avenue. There are multiple castings of this work by the renowned sculptor. They are installed at Boy Scout headquarters all over north America. Unknown artist, a gift to the University of Ottawa situated between the two parking lots on the western edge of campus near waller street and north of the residential complex. Ivan Mestrovic and D.A. Topolski. 1920 and 1972. This is located in the boulevard on Lyon Street where it intersects Wellington. This work was built in two parts the frieze came first followed by the addition of a "frame" which holds the frieze. Jill Anholt, 2014, Aluminum, programmable LED lights. Lansdowne Park Ottawa. Bruce Garner bronze wind vane. 2000 at CHUM rdio 87 George Street Ottawa. Henry Wanton Jones, 1975.Cast Fiberglass. Installed near the intersection of Champlain and Victoria behind Place du Portage in the City of Gatineau. Commissioned by the Department of Public Works Canada. Pat Durr, Acrylic Painting 1990. Second floor Heron Road Community Centre, 1480 Heron Road. Juan Geuer, 1991 Microphone, loudspeakers electronic proximity sensor. John G Diefenbaker Building 111 Sussex Drive Ottawa. This is an interactive sound "sculpture" which announced the arrival ofvisitors in the entrance pavilion of Moishe Safdie'sOttawa city Hall. Presumed to be inoperative today as the building is re-purposed. "Veterans of Vanier and the H.M.C.S. Eastview"
John Ellenberger, Ca 2000 Vanier Legion Hall, 294 Cyr.There are 30 murals distributed throughout Vanier ( formerly Eastview) that deal with local history. These were paid for by the Milennium fund. Jean - Paul Mousseau, 1972, Ceramic Tiles. !22 Bank Street. PWGSC commission. More info here. On the Airport Parkway within the airport boundaries on a strip of land between the traffic lanes on the approach to the terminal buildings. Half commercial logo, and a little bit of art this is the landmark that identifies when you have entered the airport precinct. I have been unable to find anything, but I will keep looking. Gino Lorcini. 1972, Anodized aluminum.DND building North side Laurier Bridge. This artwork has seen its installation context changed several times, once it was accessible with benches close by however it is now inaccessible. Hamilton McCarthy, 1918. Bronze statue with plinth. Installed in the northwest corner of Major Hill's Park. This sculpture was once installed at the base of the Jacques Cartier Monument across the road from its present location. Its historical relationship to Jacques Cartier and the positioning of the artwork in relation to Cartier was so controversial and questionable that it was re-situated. There is a fuller account here. Unknown graffitti writer, Chinatown 800 block south side of street ca 2004. Stuart Kinmond, 2015, Aluminum and Plexiglas, Carleton University O-Train station. Detail from "The hunt (crouching native with deer)"
Christopher Keene 1986 . Cast Bronze in several parts, 220 Laurier Avenue West. Andrew Stonyer, 1989, Steel and movable parts. Sparks street Mall Ottawa. Theis sculpture has been removed and destroyed ca 2014. Joel Shapiro,1999, Steel, 490 Sussex Drive Ottawa. Installed at the top of the staircase between Sussex and Mackenzie drive . "Il/elle n'a pas de nom"
Marc-Antoine Coté 2015 Aluminun. Located at the bottom of stairs on the North side of Alexandra bridge opposite the Jacques Cartier monument. Pauta Saila, 1999 Bronze, Jeanne d'arc court between Clarence and York streets in the Byward Market. NCC commission. Chantal Gaudet /Stantec 2013. Concrete, steel , paint and granite. At the intersection of Gladstone and Preston streets. Business improvement area commission. Tim Des Clouds, 2015 water jet cut stell, epoxy paint , poles. 26 sculptures Installed on Bank Street in the Glebe. "Ottawa Firemans and 9/11 memorial"
Louise Carota. 2009, Metal figures, granite, incised stones and plaques. 110 Laurier avenue west. Commissioned by donations to a foundation created for the purpose of erecting this monument. No peer review selection process or public consultation. "Mur fermé et ouvert n° 45"
Yves Trudeau 1978 , painted steel. Installed at the intersection of Aubry and Promenade du Portage, Gatineau. This is an NCC commission. Bruce Garner 1988. Bronze columns with natural stone. 161 Elgin Street Ottawa. Ontario Government commission. General Idea . ( A.A.Bronson, Felix Partz, Jorge Zontal). On the facade of the Ottawa Courthouse (provincial courts) , 161 Elgin street. 1990, crushed stone and fiberglass resin. Commissioned by the province of Ontario. A and B Associates ( René Pierre Allain and Miguel Berlanga) , 1983, concrete forms and steel with landscaping. Located on the west side of Elgin Street at Argyle street attached to the headquarters for the Ottawa Police Dept. Commissioned by the City of Ottawa. Susan Feindel, 1995 Pleasant Park Station, Ceramic and glass mosaic on both sides of the transitway. Randall Anderson, 2007, cast Forton. Located on the Ottawa side of Alexandra Bridge on the south side. Canadian Heritage purchase. Hal Ingeberg 2010, Glass Steel On des Allumetieres near Maisonneuve on the east side of the street in Gatineau. NCC commission. This structure is open and can be entered from the opposite side. there is another photograph here. "Water Planet and Black Nest"
Roxy Paine 2010, Stainless steel. Located behind the gallery on Nepean Point. Designer/artist unknown, ca 1972?. Nepean Sportsplex 1770 Woodroffe Avenue Nepean. The entire facility is punctuated with different painted designs that are unattributed. They may be the work of the architect ? James Boyd , 1973, restored 2013. Painted eyes on west side of the University physics building facing the Rideau Canal. "The Valiants Memorial - Isaac Brock KCB"
Marlene Hilton Moore, John McEwen, 2006. !4 figures in bronze depicting Canadian Military heroes. View to the east looking down Rideau Street from Sapper's bridge. This is one of many new military commemorative works that were commissioned during the Harper government's tenure. "The Valiants Memorial - Lieutenant Colonel Charles-Michel d’Irumberry de Salaberry, CB""
"Dorothy O’Connell Monument to Anti-Poverty Activism"
CJ Fleury, 2004. Concrete. South Lawn Ottawa City Hall Elgin Street, beside the old Normal School. Charles Daudelin, 1978 Parc des Portageurs Boul. Alexandre-Taché at rue Montcalm Gatineau . Catherine Widgery 1993. Cast Bronze and aluminum. Two of three elements are visible here all of which stand in a reflecting pond , the missing element is a cast aluminum tree without foliage. This is located behind the John G Diefenbaker building which is the former City Hallat 111 Sussex Drive. This was commissioned as part of the percent for art programme applied to the new building by Moishe Safdie. "Three Forms By The Sea"
Pierre Bourgault - LeGros, 1984. Painted concrete. Located on the Ottawa river south of the bikepath in Parc des Portageurs, Gatineau, An NCC commission. Sorel Etrog 1967, Cast bronze. Originally made for Expo 67 and like many other works made for the same venue was accessioned by the Canadian Government. Formerly located in a plaza at the southwest corner of Bank and Wellington street. Current location unknown. Originally titled "Love" . Raoul Hunter, 1967 Bronze. Southwest Lawm, Parliament Hill. Ruotolo, Bronze, installed 2011. This plaza contains other commemorative works and has been completely renovated since its initial iteration inCanada's Centennial year .1967 The original fountain can be seen here. Adrian Gollner, 2013. Steel. Installed on the north side of 131 Holland Avenue, visible from Wellington Street. This was commissioned by Domicile Developments. Daniel Young and Christian Giroux2014, prefabricated and repurposed furniture components re assembled. Minto Recreation Complex Barrhaven 3500 Cambrian Drive. City of Ottawa Commission. Don Maynard 2011, Steel LED lights, 100 Tallwood Drive Ottawa. This artwork is illuminated from with in the evening. Anodized Painted Aluminum ca 2000 @00 Montcalm Gatineau Quebec. Another anonymous design. Lynda Cronin and Micheke Provost, 2010. Glass tile mosaic. 100 Centrepointe Drive Ottawa. "Cube, Lattice, Sphere and Wave"
Mark Thompson 2015, Concrete , glass, Led lights. Rideau Street at Coburg. One of four similar works also seen at Waller, Wurtemburg, Friel and Rideau. "A view From Two Sides"
Ken Emig 2105 Stainless steel, at Adàwe crossing a pedestrian and over the Rideau River between Donald Street and Somerset Street East. View is to the Northeast. John Hooper 1981, Wood and paint. Formerly installed north of Le Restaurant at the NAC on the Rideau Canal. Ted Bieler 1967 , Fiberglass. Installed at the Tin House Court in the Byward Market. This sculpture was commissioned as parf of the expo 67 art initiative.No longerinstalled at this location. Victor Tolgesy 1968, Corten Steel, installed at thTheatre de l'ile on Brewer's Creek in centray Gatineau. This is a smaller version of Explorer 1 which was shown at Expo 67. Gerald Gladstone , 1971 Plexiglas, steel, sound sensors, relays and lights. Interactive light sculpture by Gerald Gladstone ca 1970. 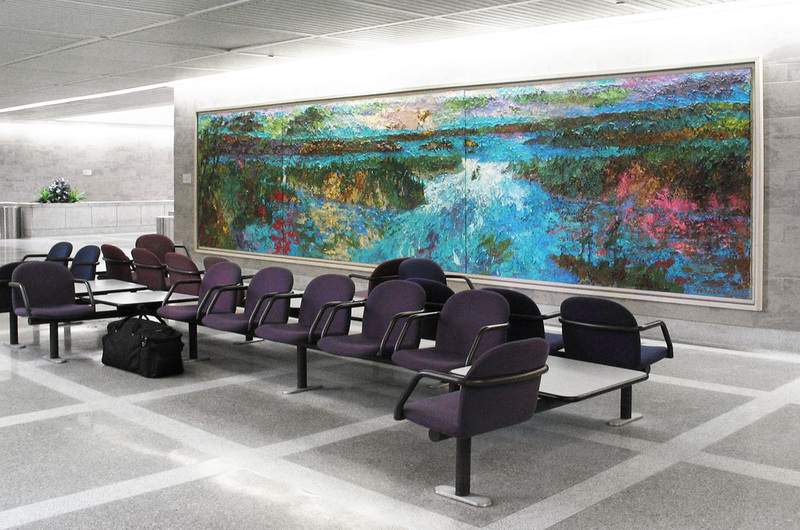 This work was installed in the Carleton University unicentre on the south side of the staircase shown. As people climbed the stairs their presence was detected and lights would blink while loud clicking noises came from behind the plexi panels of the sculpture . Tom Sherman 1990 , Glazed concrete block. at the Lycée Claudel Transitway Station station near Hurdman Park and Riverside Drive. Louis Archambault, 1967 Painted steel. Installed at the Canadian Museum of History 2005. These works werecommissioned for Expo 67. Barbara Hepworth, 1970 Bronze, Installed on O'connor street between Laurierand Gloucester, East Side. Adjacent to theEsplanade Laurier building. Corporate commission, Reichmann corp? John Ivor Smith, 1967. 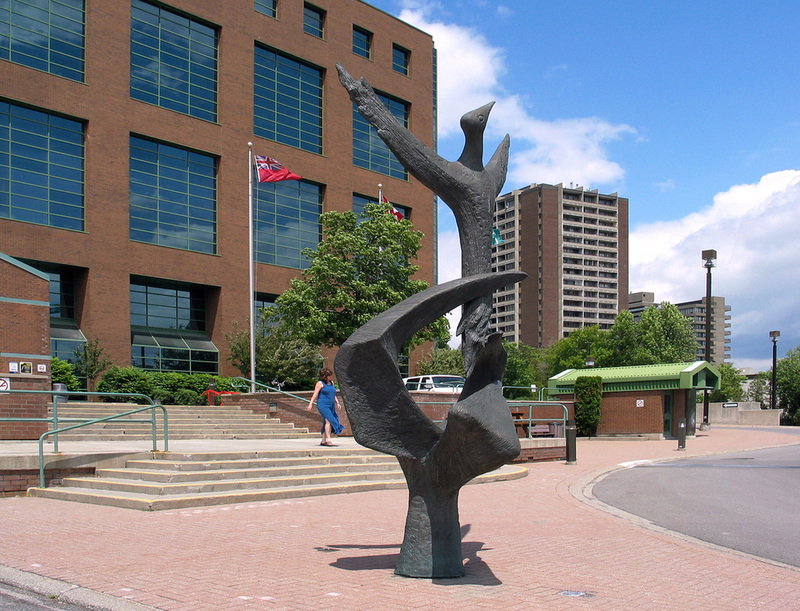 This sculpture was originally commissioned for the Canada Pavilion at Ezpo 67 in Montreal.Theart work is located in Clarendon Court, a pedestrian mall between George and York streets close to Sussex Drive. "The Spirit of French Canada"
Art Price, situated on the front lawn of Artscourt and the Ottawa Art Gallery at Nicholas and Daly. This view looks west. This work is part of the Firestone Collection. Art Price, 1961, Installed in Gatineau in 1997. Bronze. Donated to the city of Gatineau by the Prudential Company on the occaision of the 150th anniversary of the city. Richard Nigro, 1986. Located on Laurier Avenue near King Edward avenue in front of the fire station. City of Ottawa Public Art Programme Purchase. Various Writers 2000 to present, Below the Dunbar Bridge on Bronson Avenue is a municipally "free" zone for graffitti writers. Shayne Dark,2015. Cor-ten steel. Installed at the junction of Trim raod and Antigonish in eastern Ottawa. Another photograh here. Adrian Gollner 2009, Coloured Glass, Shenkman Arts Center Ottawa. Bill Mcelcheran, 1976, Bronze. Behind Lasalle Academy / Treasury Board 373 Sussex Drive . "Twelve Points in a Classsical Balance"
Chung Hung , 1981, Cedar. NCC Commissioned work. Installed on the lawn in frontof Garden of the Provincessouth of the National Library on Wellington Street. "Monument to All Fallen Soldiers in all Wars"
No information about the sculptor. Granite with Inscription. The Alpine Club commissioned this work. Armand Vaillancourt, 1966. Painted cast iron . Located in a nichebetween the Connaught Building and the stairs, Sussex drivewest side just north of Rideau Street. Jennifer Stead , 2015 Water cut powder coat pained steel .Byron and Churchill Avenue . Francois Montillaud, 2015. Concrete and cast painted aluminum. Southeast corner at the intersection of Laurier and Pont du Portage, Gatineau. Cheryl Hamilton and Michael Vandermeer, 2008. Stainless steel poles and banners. Intersection of Riverside Drive, Alta Vista and Industrial Avenue at the R A Bloch Cancer survivors park. Victor Salmones, 2009. Cast and painted bronze figuresThis is part of the R A Bloch Cancer Survivors park in Ottawa at the intersection of Riverside Drive, Alta Vista and Industrial Avenue. This is one of 25 such parks in North America and all of the parks share this sculpture. and doorway. "Woman at the base of Sir John A MacDonald's Monument""
Louis-Philippe Hébert, 1895, Bronze one and a half times life size. Unidentified figure used at the pedestal. Stephen Braithwaithe,1989, Glass ,granite and steel.Two figures collaborate on the erection of a metaphorical structure. Installed in City Council Chambers . "untitled" Andre Fauteaux, Cut steel forms, Constitution Square, main foyer , Kent and Albert Street Ottawa. Jack Harman, 1992. Jointly commissioned by The National Capital Commission and the Department of National Defence.This large monument stands on an island in a major intersection flanked by a Cathedral, the National Gallery, the Interprovincial Bridge, a fine view of the Houses of Parliament and the new Americam Embassy. The NCC is the government agency that determines the look and feel of much of this city. As an art patron they have become more active in recent years installing commemorative works along the designated "ceremonial route" within the city. Chief James Hart, 2011, Bronze. At the corner of Sussex Drive and Saint Patrick Street. Detail "Sir Arthur George Doughty"
Robert Tait Mckenzie 1938- Completed by Emmanuel Hahn 1940. Bronze with inscribed pedestal Behind 395 Wellington Street. Sir Arthur George Doughty (1860-1936) was a noted historian, librarian and Dominion Archivist until 1935. "Sit for a While, In the Garden, and Watch the Parade"
Tim desClouds 2014, water cut powder coated steel. McNabb park 435 Bronson Avenue. Trevor Gould, 1990, Iron "Fable VII", text on window glass, steel and concrete. 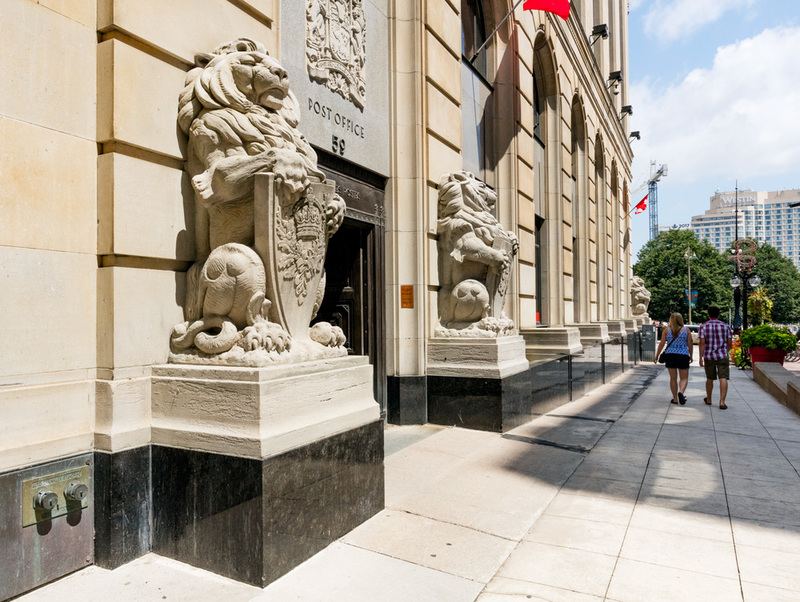 Located in City Hall 111 Lisgar Street, Ottawa.The window faces east towards the Cartier Square Drill Hall which is the headquarters for the Governor General's Foot Guards. Marion Dewar Plaza City Hall Laurier Avenue. This is a pedestrian activated sound installation as well as a sculpture.